You may choose among several types of Voodoo dolls depending on which elements you wish to attract or strengthen in your life. I do not cater to the belief of harming another through the use of Voodoo dolls and pins. First because what you sow, thou shall reap so it is never a good idea to put out negative energies into the world. Negative energies are very difficult to control who needs more of those out in the world? Second because the very origins of voodoo dolls were to cause healing for a person who might not be treated in a physical way. Therefore I have chosen to offer dolls according to their original functions: to attract good things to the person who uses them as a focus for meditation, visualization and strengthening of one's resolve to better himself or herself. Each Voodoo doll is hand-made by myself. I use very natural and simple material that I gather in the marshes and woods around my house. These are the traditional elements that would construct a voodoo doll. 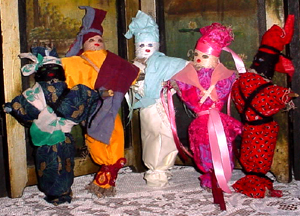 I dress each doll according to its desired function again using only natural materials such as cotton or silk and decorating it as the Loa guide me. Often times, I start a doll with an idea but it changes before my very eyes and takes on a personality that I had not expected. It will reveal its exact function, purpose, and the ways it must be used. Sometimes it even reveals to me its name. All these particulars about their very own doll are transmitted to each client with the instructions. My dolls are a lot of fun and bring unexpected success. I enjoy making them and you will enjoy their Magick! !